The enhanced Gift Batch interface mimics Excel, by using a tabular format to facilitate rapid data entry, and allows you to tab from field to field as you enter gift information. To enable Enhanced Gift Batch in your Causeview instance, see configuration guide. Batch Templates allow you to specify fields to include in the interface. Presets can also be specified within the template. Click on the “Gift Batches” tab from the tab ribbon. If you do not see the Gift Batches tab within the tab ribbon, click on the “+” at the end to access all tabs. You will see Gift Batches in the list of all tabs. From within the Gift Batches tab, click on the “New” button. Enter a name and an open date for the Gift Batch. The open date will default to the current date. Next, select the Batch Template to be used. 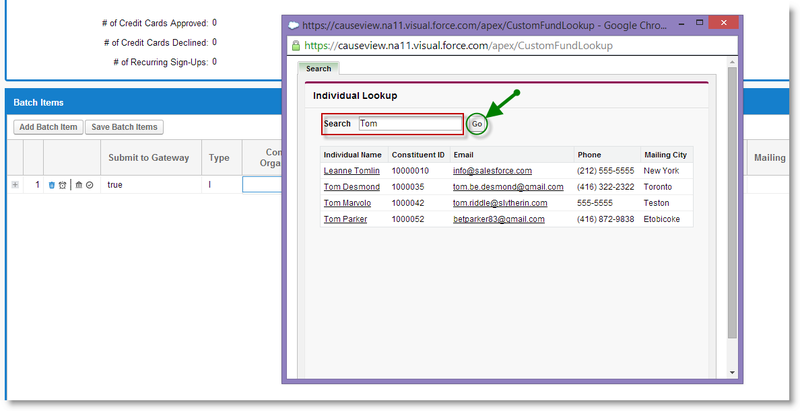 Click on the look-up icon beside the Template Name field to search for an existing template. To better understand how Batch Templates impact your Gift Batch, read the article here . Once a Batch Template is selected and the Gift Batch record is saved, you will no longer be allowed to select a different template. You may enter a description for the Gift Batch. Leave the Close Date blank as Causeview will automatically populate the date when you commit the batch. Then, click on the “Save” button. The Gift Batch Interface will launch and display on the page. The Gift Batch Summary allows you to enter and modify gift batch information such as the gift batch name, description and total projected gift amounts. Click on the “Save” button located at the bottom right corner to save the information you’ve entered or modified. You may collapse this section by clicking on the arrow located at the top right corner. The Batch Reconciliation section provides you with a running total of your batch items, including the number of Credit Cards approved or declined at the payment gateway. The Batch Items section allows you enter gifts and process payments. A delete icon, pledge icon, payment gateway icon and save icon appear beside each batch item line. If the Gift Bath Template you selected for the Gift Batch contains Credit Card or ACH/PAD as a payment type, a “Submit to Gateway” column appears within the Gift Batch Interface with a default value of “True”. This means that credit card or ACH/PAD batch items will be submitted to the payment gateway for processing when you save your batch items. If the credit card or ACH/PAD payment is declined at the payment gateway, the value will change to “False” and will allow you to re-submit the payment. Please refer to the section of this article on Re-submitting failed online payments. The Gift Batch Interface allows you to enter gifts received from an Individual or an Organization. 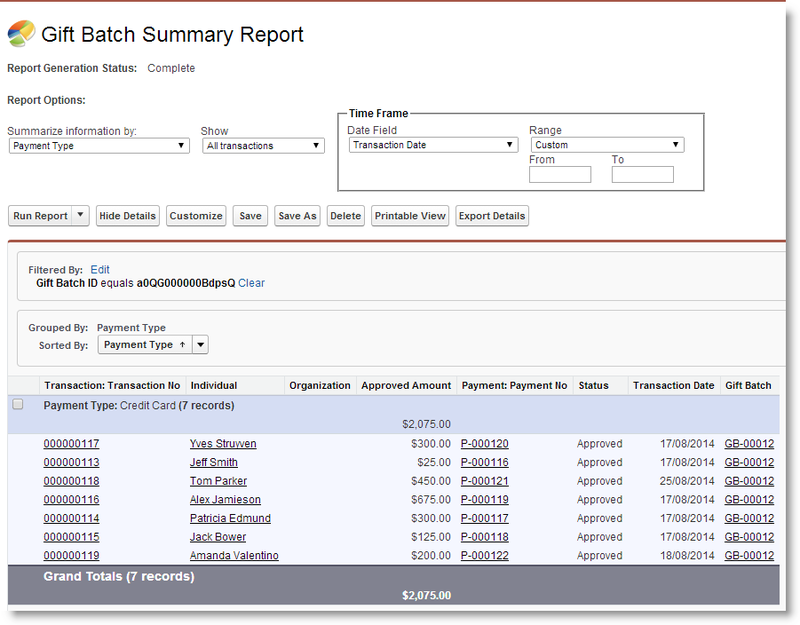 When entering a batch item, you will need to first select the transaction type. Select “I” for gifts received from an individual. Select “O” for gifts received from an organization. The Gift Batch Interface will automatically adjust and display fields for an individual or an organization, depending on the transaction type you select. It is best practice to check if the constituent already exists within the application. 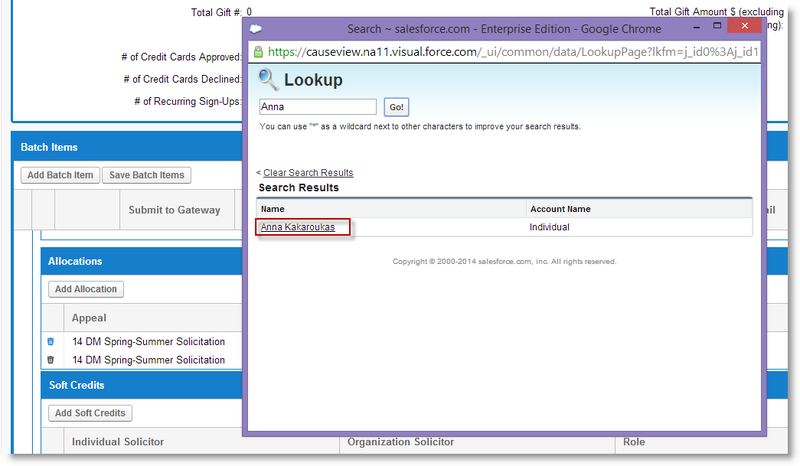 This prevents you from unnecessarily creating duplicate constituent records in Causeview. To search for a constituent, click on the look-up icon beside the Constituent ID field. Then click on the “Go” button. Click on the Constituent’s name to select the constituent. When an existing constituent is selected, the constituent’s information is populated in the Gift Batch interface. You may modify the constituent’s information if needed. If the constituent you searched for does not exist within the application, you may manually enter the constituent’s information within the Gift Batch interface. The Gift Batch Interface mimics Excel where you can tab from field to field as you enter information. This facilitates rapid data entry. Fields you have specified to be “Shown in Summary” in the Gift Batch Template are displayed as columns in the Gift Batch interface. Fields that are not shown in the summary (fields that do not appear as columns) can be accessed by expanding your view. Click on the “+” beside your batch item. Fill in the required gift and payment information. The Gift Batch interface allows you to split your allocations. Expand your view by clicking on the “+” beside the batch item. In the expanded view, scroll down until you locate the Allocations section. Click on the “Add Allocation” button to add as many allocation line as you need. Enter the allocation information. The sum of your allocations must equal but not exceed the payment amount. If you need to remove allocation lines, click on the delete icon beside it. Soft credits may be applied to another individual or organization from the Gift Batch Interface. In the expanded view, scroll down until you locate the Soft Credits section. If you wish to apply a soft credit to multiple individuals and/or organizations, click on the “Add Soft Credits” button to add as many soft credit lines as you need. Place your cursor in the Individual Solicitor field if you wish to apply a soft credit to an individual. Otherwise, place your cursor in the Organization Solicitor field if you wish to apply a soft credit to an organization. After you place your cursor in the field, a look-up icon will appear. Click on the look-up icon to search for an individual or an organization. Search for the for a constituent. Enter the individual's name if you are applying a soft credit to an individual. Enter the organization's name if you are applying a soft credit to an organization. Next, specify the constituent’s role. The soft credit amount will default to the full payment amount. You may change edit this value if you wish to apply a partial soft credit. To add a new batch item line, you can tab all the way to the last column and it will automatically insert a new line. You may also click on the “Add Batch Item” button to add a new line. Recurring donations can be entered within the Gift Batch Interface. From the Gift Type picklist, select “Recurring” then enter the recurring amount in the Payment Amount Field. When entering a recurring donation, make sure you also provide a start date and a frequency. If these fields are not displayed as columns within the Gift Batch interface, you will find them in the expanded view. You may also enter a future start date if the constituent requests that the first payment be processed at a future date. When entering recurring gifts from an organization, you must specify a contact. 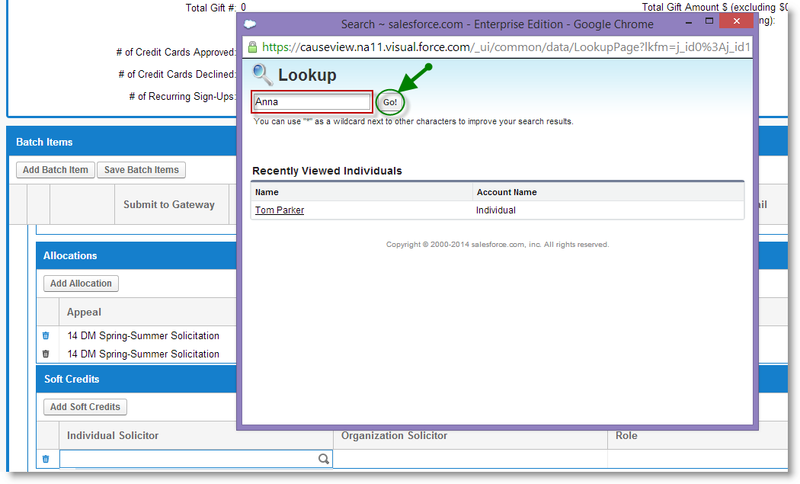 Click on the look-up icon beside the constituent ID field to search for an existing contact. Receipts can be automatically emailed to donors from the Gift Batch Interface. This requires the “Auto Email Receipt” field to be included as part of your Gift Batch Template. To automatically send the receipt to the donor by email, select “Auto Email Receipt”. Once you’ve finished entering your gifts, you may now save your batch items. Saving your batch items will also process any credit card or ACH/PAD payments at the payment gateway. To save your batch items, click on the “Save Batch Items” button. As a security measure, unsaved credit card or ACH/PAD information you have entered within the Gift Batch interface are cleared after a scheduled period of time (usually two hours), or if you navigate away from the page. If you require more time to enter your gift items, or if you need to move away from the gift batch, save your batch items. It is recommended that you save your batch items at regular intervals if you are entering a large number of gifts. Causeview does not re-submit payments that have already been saved and processed. A confirmation message will display, indicating the number of batch items saved successfully. If there are batch items where the payment type is credit card or ACH/PAD, it will also indicate how many of these were approved (processed successfully) and declined by the payment gateway. Click on “OK” to return to the Gift Batch Interface or click on “Return to Batch Summary” to go back to the Gift Batches Tab. If a credit card or ACH/PAD payment is declined by the payment gateway, the payment gateway icon will turn red and the “Submit to Gateway” column will display a value of “False”. You may then check you batch item and make the necessary corrections. Then, click on “False” under the Payment Gateway column. A check box will appear. Place a check mark in the check box and click on the “Save Batch Items” button. This will re-submit the batch item to the payment gateway for processing. Committed (closed) Gift Batches will not allow you to edit the gift batch or add new batch items. To commit the batch, click on “Commit Batch” button located on top of the Gift Batch. A confirmation message will display. Click on “OK” to continue. Causeview will then compare the amount in the Batch Reconciliation section to the projected amount you specified within the Gift Batch Summary. These values must match in order for the application to commit the batch. If these values do not match, a message will display on top of the Gift Batch Summary. Check your batch items and verify that the gifts were entered correctly. If the batch items were entered correctly and the gift summary needs to be adjusted, simply edit the information in the gift summary and click on the “Save” button located at the bottom right corner. After the changes have been made and saved, click on the “Commit Batch” button again to close the batch. The Close Date is automatically populated once the Gift Batch is committed. Click on the “Report” button located at the top of the Gift Batch to produce a gift batch report. The Gift Batch Report contains a summary of the transactions entered within the Gift Batch.